Another nice article by Ayush Khadka - this time about the first Nepali to qualify for Wimbledon - Sujay Lama. To be honest, I had my doubts about the story, so I actually Googled around to verify. Sure enough, it's true! 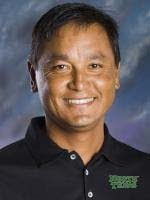 Here is a detailed profile of Sujay Lama from the University of North Texas athletics website. 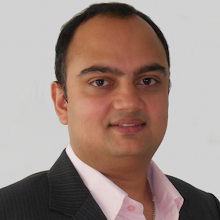 He is currently the head of the tennis program there and holds a very impressive resume. It is always great to learn of a Nepali sporting success story like the one of Lama jee. 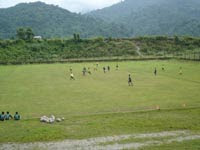 I just got back to Kathmandu from my annual football tour of Eastern Nepal. Soccer junkies trapped in Kathmandu Valley should really take a pilgrimage to Sunsari, Morang and Jhapa districts and see the grand potential of Nepali football. Those three districts alone provide around half of the players in the Martyrs Memorial League "A" Division. 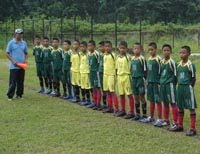 There are scores of football fields there and even the smallest tournaments attract hundreds of spectators. 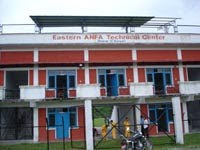 ANFA recently built a Technical Center in Dharan, Sunsari. The top twenty four boys under the age of twelve from across the nine football playing districts in the East are training at the academy there. I'll be posting more on all these topics in the coming days. "For a country (Nepal) that produces the greatest warriors (Gurkhas) and best mountain climbers (Sherpas) in the world, developing world class athletes should be relatively simple." Judo - the president of the Nepal Judo Association manhandled because of comments he made to the media. Unbelievable! 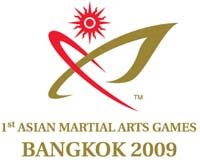 Asian Martial Arts Games - Nepal continues to falter at the event. Nepal is guaranteed a Bronze in Wushu because there are only three competitors in one of the weight categories. Unbelievable! General - the highly political Sports Minister preaching on not mixing sports and politics at an event organized by a Maoist backed sports association. Unbelievable! Football - a reactionary football players association formed claiming that All Nepal Football Players Association was formed secretly. This one is actually - Believable! The recently concluded AIA Tennis Tournament in Kathmandu was organized by a proselytizing group Atheles in Action. Going off of the information on the organization's official website their goal is to spread the word of Jesus Christ by using the popularity of sport as a vehicle. Update: Check out this video of a Christian Mass Healing function at Dasharath Rangasala. Hopefully Nepali sports will be healed too! Eighteen Nepali athletes are participating in the 1st Asian Martial Arts Games. Seeing that Nepal historically bags two or three medals at the Asian Games - we should expect similar numbers at this event. Here is a link to the competition's official website.